I'd get a pro setup on your current bass if you haven't already, you might find that keeps you happy for now. In this price range I'd look at the upper end of Squier but it's personal preference, I'm a boring Fender guy. Go with your instinct! I can add a little of recent experience to this thread. I am in the process of swapping my MIA Jazz (just dont use it anymore) for a drum kit (for my 16 yo son) and also either a Squier VM Jazz,a Squier CV Jazz or a Sterling Ray4 thrown in as well. Tried all three of the basses,and hey little difference between the CV and VM,a Jazz is a Jazz,both sound similar,both feel similar etc,etc.Not a lot of difference just the VM looks sexier. The Sterling sounds really awesome with the active pups and blending options,I really really love it,was going to take it to a jam last night BUT every time I pick it up its like picking up a lead anchor,honestly it's really darn heavy compared to all my other basses,too heavy and such a shame as it has great potential.I wont be taking it as part of the trade so will grab the VM Jazz instead,at least it doesn't weigh a ton. So be aware that the Sterling is a real heavy bass to have slung over your shoulder for 3-4 hours,but if your not a skinny prick like me it may be no issue at all,and is a great bass with lots of tonal options.If it weighed the same as my P bass I would have one in an instant. I also have a Warwick Star Bass ( i used that last night instead) which is also a fantastic bass,a personal fav, and weighs a lot less. Still havn't got round to getting the baggy pants,tribals or frosted tips to match it yet,but its on the the "to do list". Cheers Chris - I am a skinny prick and I agree that the SUB is a heavy beast. 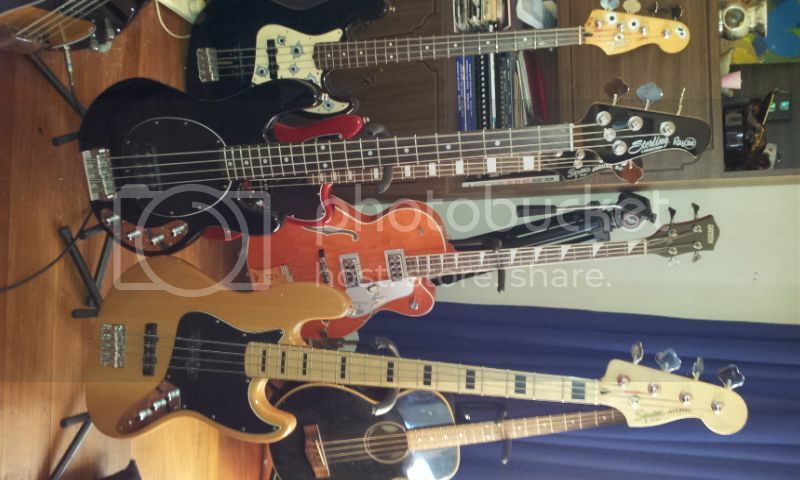 It is all down to subjective preference I guess and given that these are both entry level basses for an entry level player it is not a huge investment. I am sincerely hoping that it is not the last bass that I buy - I can imagine that this could get a bit addictive! It is addictive for some oops ,hey here are the choices I have, the Squier Jazz VM or the Sterling...are we looking at same model Sterling MarkO ? I cant believe how well the Jazz plays and sounds,a very nice bass for bucks.As timi suggested maybe worth look too ?